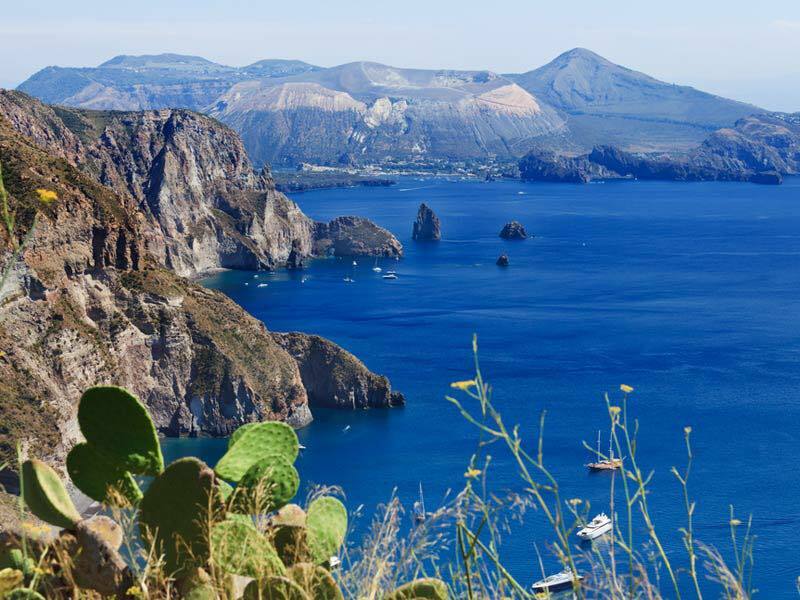 The archipelago of the Aeolian Islands, situated off the northern coast of Sicily, is a place of overwhelming natural beauty, made all the more special by its particular volcanic nature. 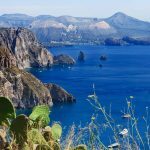 The islands of Lipari, Stromboli, Vulcano and Panarea, to name just the most famous, are home to tiny fishing villages and small rural settlements, settling under tall imposing volcanoes, some of which are amongst the most active in the world. Altogether this results in a spectacular landscape, where man and nature have lived together for thousands of years, which is one of the reasons why the area is listed as UNESCO World Heritage. Though living literally on a volcano certainly certainly implies some risks, the volcanic earth also provides an extraordinary fertility – the basis for a rich agriculture, though limited by the steepness of the slopes. The flavour of the volcanic soils is still testified by the very good wines produced on these islands! You’ll discover a real walking paradise here. 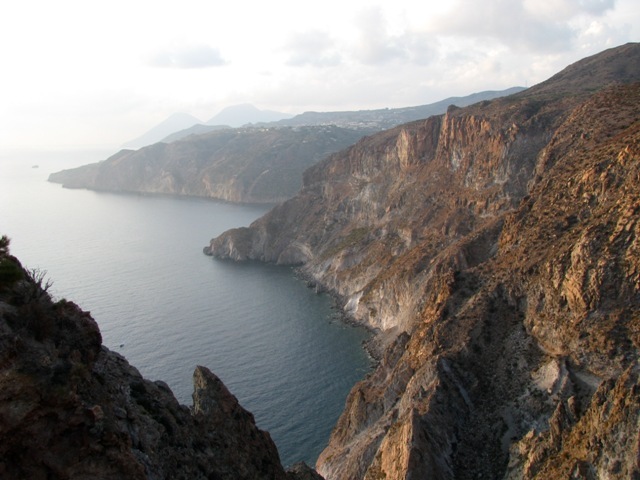 When you visit the Aeolian Islands you will discover vast black beaches contrasting with red or light-coloured shores, where inaccessible and winding rocky coasts alternate with beautiful beaches and large barren areas lie alongside beautiful lush gardens. During the first days of your tour you’ll spend some time in Milazzo, too often overlooked and used only as a gateway to get to the islands. The village of Milazzo boasts some of the most interesting historical centres of the area, Greek remains, a huge medieval castle and last-but-not least, a beautiful promontory, stretching so far out into the Mediterranean towards the Aeolian Islands, that it can almost be considered an island by itself. During the second half of your tour you will stay on the islands of Lipari and from there visit Lipari and Stromboli, exploring the archipelago’s wild nature and ever-changing geological aspects. 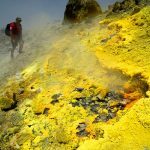 You will hike on the black beaches and slopes of Vulcano, observing its ‘fumaroles’ constantly erupting hot gases, and be able to bathe in its thermal springs and sulphuric mud. The views from the top over the other islands and the coast are spectacular to say the least. 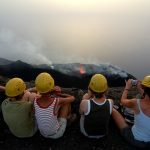 On Stromboli you will have the opportunity to walk on the slopes of one of Europe’s most active volcanoes, witnessing the scars left by its many eruptions and watching the construction of a new landscape as it happens. 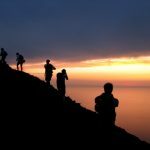 You’ll have the opportunity to take a guided walk up to the very summit of the volcano for an unforgettable experience while watching eruptions and lava flows mould the earth into shape. 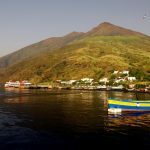 But of course you will also have plenty of time to discover the tiny villages stretched out along the coast, where time seems to have stood still and the friendly locals will always greet you with a smile. Meanwhile you will have the opportunity to sample genuine Italian cuisine, based on seafood and locally produced wines. Please note: this is a moderately easy tour which is suitable for those who have some experience of walking and a good general physical condition. Most of the walks are on good paths, sometimes on steep terrain. 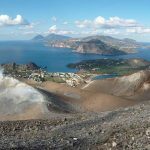 People with respiratory problems may have discomfort in sulphurous areas with fumes – Stromboli offers some vertiginous sections, but alternative walks are possible. Average walking times: approx. 3 to 6 hours each day. Arrival in Catania or Palermo in case you arrive earlier. Both Palermo, as well as Catania International Airport can be easily reached with daily flights from many cities in Europe and other major in Italy. Several hotels can be booked in town, according to your wishes (either ‘downtown’ centrally located, or near the harbour or train station, ranging from 3- to 5-star). By train or bus you travel to the harbour town of Milazzo on Sicily’s northern coast. After settling in at your centrally located hotel, you will have time to explore the town’s historical centre, dominated by the enormous medieval castle. In the evening you can stroll through the little alleys of the town, finding a suitable place for a hearty dinner. Today you’ll have a full day to explore Milazzo. Milazzo is an important town on the coast of north-east Sicily, gateway to the Aeolian Islands, but too often overlooked as a tourist destination itself. The town itself is very interesting: it boasts some of the most interesting historical centres of the area, Greek remains, a huge medieval castle dominating the “Old Town” of medieval origin at the foot of the hill, and some fine ‘fin-du-siècle’ architecture along a nice seaside boulevard, with several small inlets, still used by traditional fishermen. But perhaps the main attraction of Milazzo is its cape. Capo Milazzo is a beautiful promontory, stretching so far out into the Mediterranean towards the Aeolian Islands that it can almost be considered an island by itself. 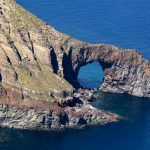 This promontory offers some great hiking possibilities, which will find you face-to-face with the Aeolian Islands, a good introduction to the rest of the tour. To end your first walking day there are several nice beaches, where you can go for a swim and stay for an aperitivo until sunset. To end the day in style you’ll have the choice of many nice little restaurants in the medieval alleys of the ‘Old Town. 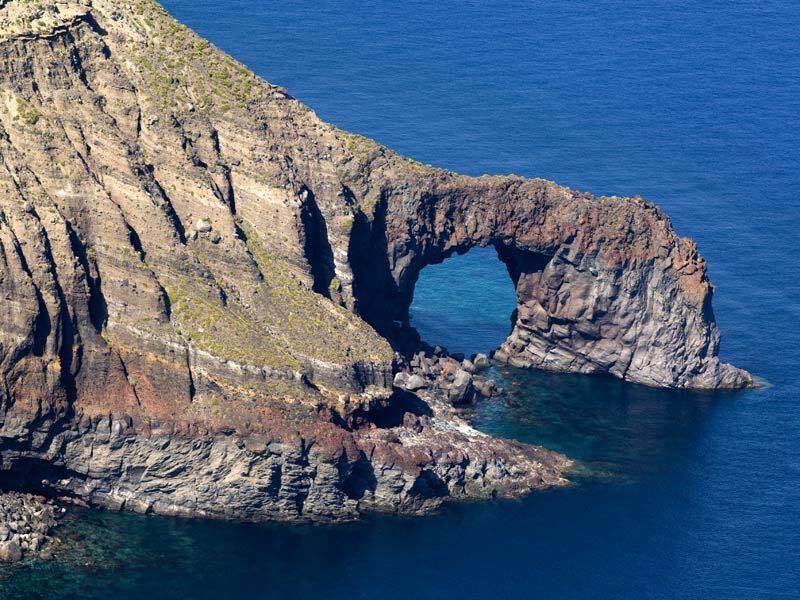 This morning you will take the hydrofoil from Milazzo to Lipari, the largest of the Aeolian Islands, and the ‘Heart’ of this volcanic archipelago (about 1 hour). You can check in at your centrally located hotel, and make a first stroll through the centre, dominated by the local ‘Castello’, which actually is a fortified citadel, including houses, churches and a complete theatre. Just below the castle you’ll reach marvellously situated port of Marina Corta, which has retained its authentic island charm. 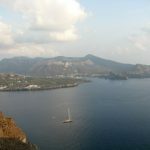 From here you can then walk to the southern side of the island, along the ‘Route of the Capers’, which offers a wonderful views on the crater on the nearby island of Vulcano. The hike continues along the west side of the island, one of the wildest, and spectacular parts. There are several options for longer or shorter walks. On your way back to your hotel you may want to visit the remains of the Greek tombs and Greek theatre, as well as have a look at the site of a prehistoric village near the castle. After freshening up at your hotel you can wander through the Marina’s little streets in the evening and stop for a pre-dinner ‘aperitivo’. You are free to choose your own evening meal tonight – there is the choice of several small restaurants, many of which offer genuine fresh seafood. 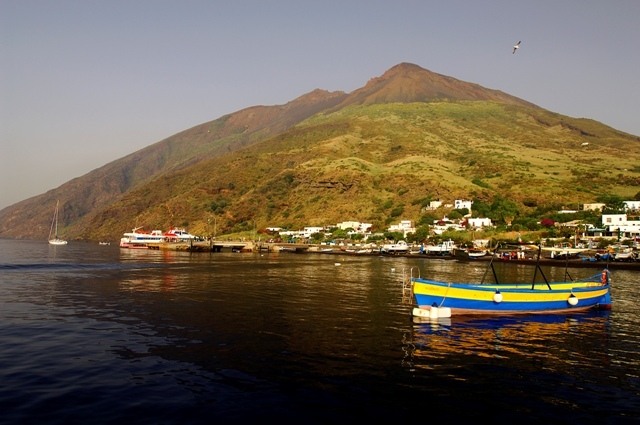 After breakfast you take the hydrofoil from Lipari to Vulcano (10 min.). 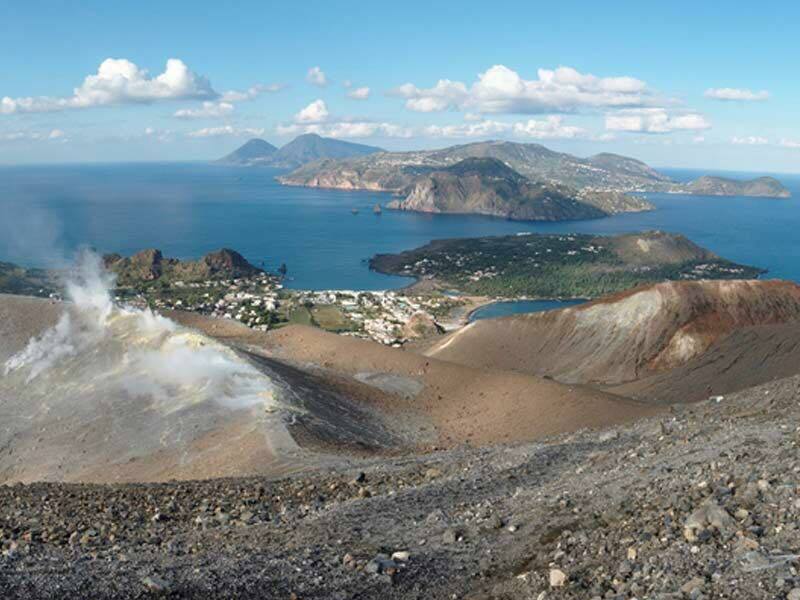 This island, dominated by the extinguished crater of Vulcano della Fossa, takes its name from the Roman demigod ‘Vulcanus’, the blacksmith of the Gods. 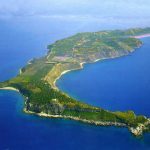 The Roman name for the island has since come to mean what we now know as a volcano in most modern European languages. Famous for its black beaches and thermal springs, the island is an important tourist destination during high season, while retaining its quiet and laidback character during spring and autumn. 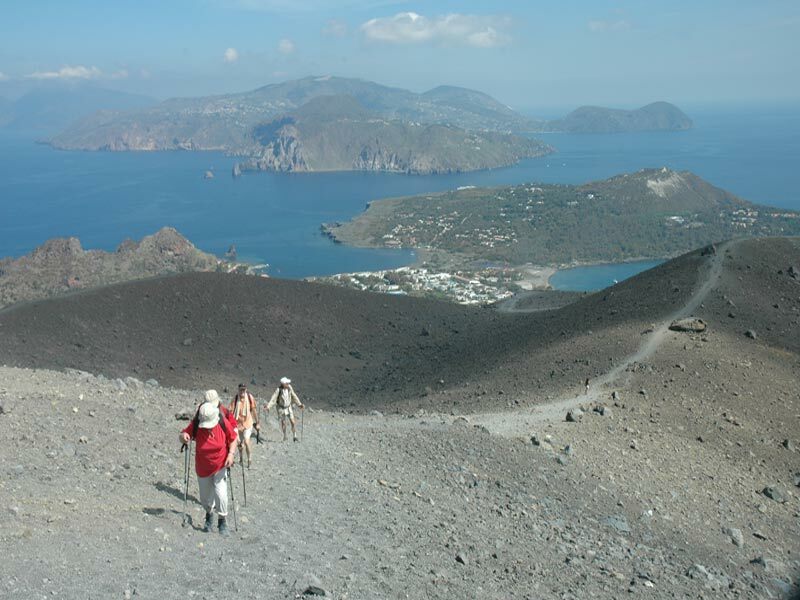 A must-do hike on the island is of course the ascent of the Vulcano crater. The views from the ridge are spectacular, and on clear days you can admire all islands of the archipelago as well as mainland Sicily. 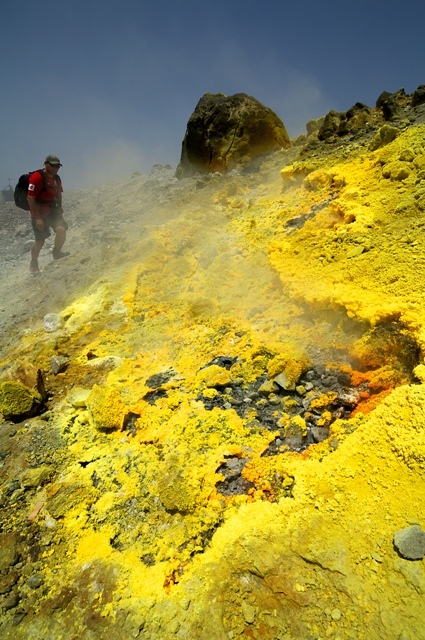 On the way back down you’ll walk to clouds of steam and sulphur and can admire a large number of ‘fumarole’, openings in the earth’s crust which still emit steam and gas, created when superheated water turns to steam as its pressure drops on emerging from the ground. After your hike you will have plenty of time to lounge on the beach and visit the thermal springs where you can enjoy bathing in sulphur mud baths. In alternative there also is a longer hike, which brings you into an unreal landscape of lava tunnels. In the evening you take the hydrofoil back to Lipari. After dinner you can take another stroll through the marina, and why not enjoy a ‘gelato’ before turning at the hotel. 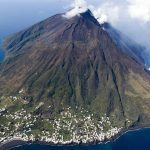 In the morning you take the hydrofoil from Lipari to Stromboli (1h), the northernmost of the Aeolian Islands and one of the world’s most active volcanoes. It was here that the heroes of Jules Verne’s ‘A Journey to the Centre of the Earth’ find themselves after being ejected from the earth by volcanic activity. 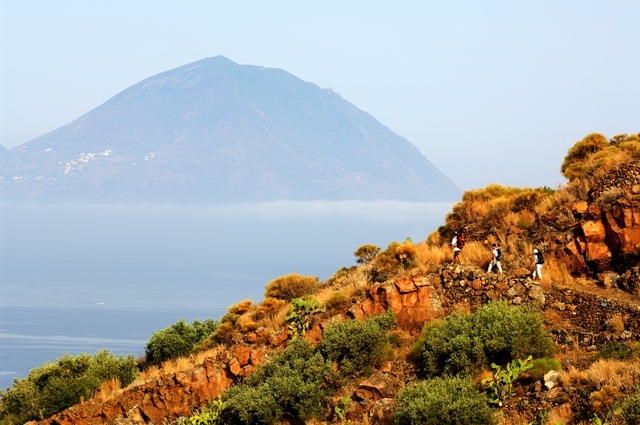 Here you have the choice of several walks, from easy strolls to a strenuous hike to the very top of the volcano. 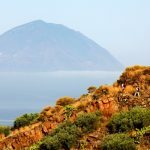 The easiest option is a short hike around the lovely village of San Vincenzo, soaking up the unique island atmosphere and perhaps relax on the island’s volcanic black beaches. 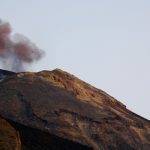 You can also pay a visit to the ‘Sciara del Fuoco’, a large horseshoe-shaped depression in the summit area offering a wonderful view of the craters. But most will opt for the hike to the top. This hike to the still active crater must be accompanied by certified volcano guides. 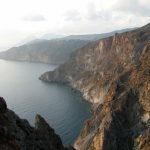 They will take you up to the edge of the crater, over 900 m. high, where you will have the opportunity to admire the ordinary, daily volcanic activity of the island, including intermittent explosions of ash and incandescent rock, reaching up to 120m high. Larger events, including the expulsion of large lava streams, are observed regularly, most recently in 2002-03 and 2007. 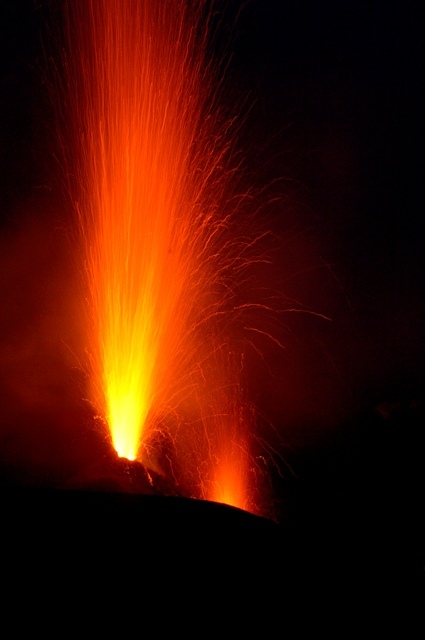 Watching an active volcano at work is a dramatic and extremely thrilling experience. 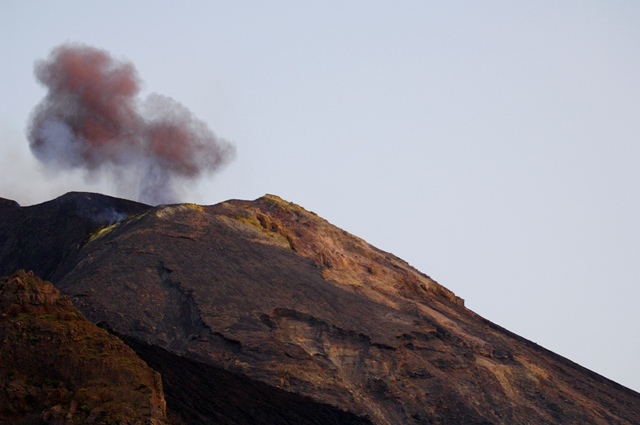 You should, however, be aware that in case of adverse weather conditions and extraordinary volcanic activity the volcano guides may deem it impossible to walk up the volcano, according to safety measures. At the end of the afternoon you’ll take the boat back from Stromboli to Lipari, where you can freshen up and relax before going out to find a nice spot for dinner. 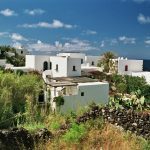 In case you book an extra day, or in alternative to the visit to Stromboli (in case the boats don’t run – this often happened early or late in the season) you can go for a visit to the beautiful island of Salina. Here you have several possibilities for a daywalk or a stroll, ranging from an easy stroll in the villages of Santa Marina, Rinella e Malfa, a walk on the traces of ‘Il Postino’ in Pollara or the more challenging hike to the Fossa delle Felci, the highest top of the island. At the end of the afternoon you’ll take the boat back. The tour ends today after breakfast in Lipari. You can go out for one last stroll in the village, after which you will hop on the hydrofoil to Milazzo. From Milazzo you can travel on to your next destination by boat or train. A taxi transfer to other destinations can be arranged on request. All nights are spent in characteristic hotels and family-run guesthouses. All rooms have en-suite facilities. All accommodations are on B&B basis. Dinners are not included, as there is a wide choice of restaurants in the towns and villages where you’ll be staying. No picnic lunches are included in the tour price, but these can be prepared for you by the accommodation holders, or materials for picnics can be purchased in the villages where you’ll be staying. Nights 1 & 2 : The first nights you stay in a nice hotel in the historical centre of Milazzo. The town centre and main monuments are all within easy reach. 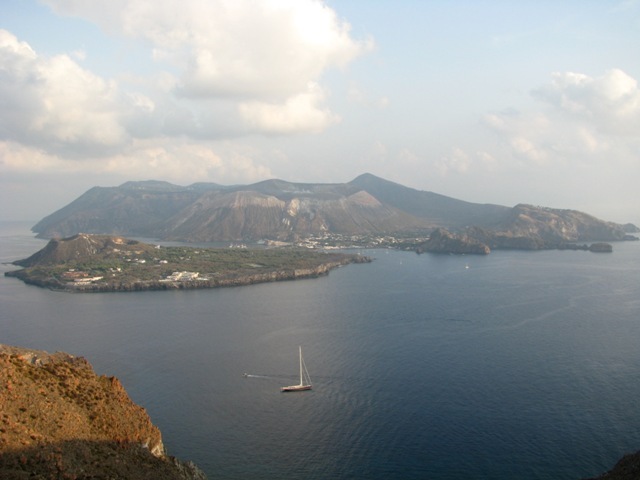 Nights 3, 4 & 5: These nights are spent on Lipari, the largest of the Aeolian Islands. Your nice family-run hotel is located near the harbour and town centre. 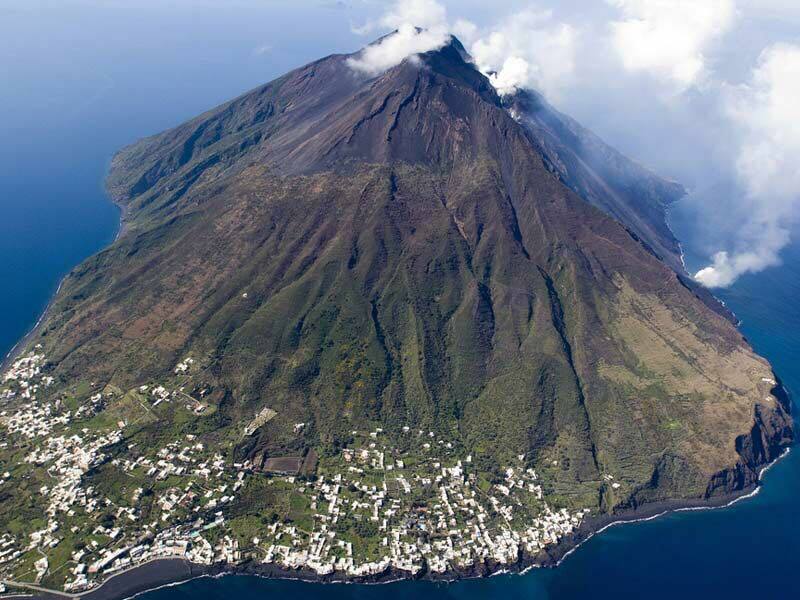 Also is it possible to add 2 nights on the island of Stromboli. These two nights you stay at a friendly hotel, centrally located, at walking distance from the seashore and the main shops in the village. 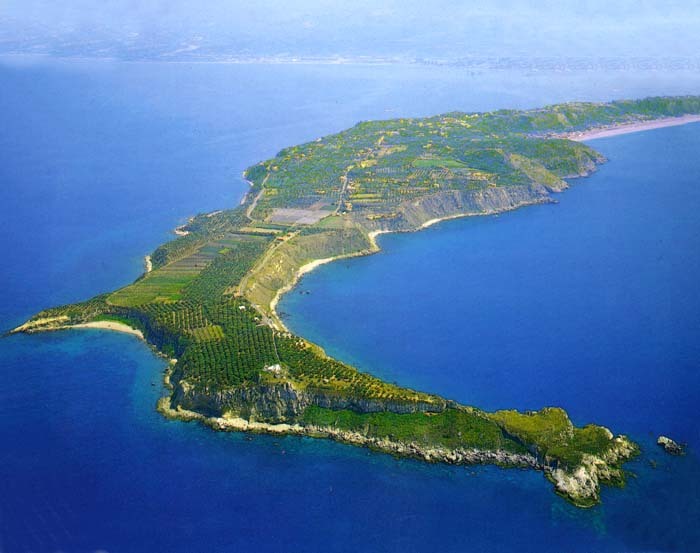 Accommodation: 2 nights Milazzo, 3 nights Lipari (+ 2 nights Stromboli); all nights in good ***/**** hotels. 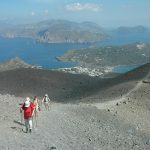 Moderately easy (2/3): Mostly easy to moderate walks, with some STEEP walking uphill, especially on VULCANO AND Stromboli (alternative walks are possible). Fitness: A good standard of fitness is necessary. You should be able to walk for up to 5/6 hours a day, sometimes in hot sun and on dusty or stony tracks. Most paths are relatively well maintained, but during the season some paths can get overgrown, and of course on the steep volcano slopes erosion can threaten some of the tracks (we are in continuous contact with local authorities to keep the paths clean – please help us by providing your feedback on the quality of the paths). Waymarking: Only a small part of the route is waymarked; elsewhere it is necessary to follow the route descriptions provided together with the maps. With these it is always possible to find your route. In case you don’t feel confident a local guide can be provided for some trails. Arrival: The tour starts in MILAZZO, a small city on the northern coast of Sicily. Milazzo can easily be reached by train or bus from the major towns in Sicily: Palermo (Airport), Catania (Airport) and Messina (ferry). Departure: The tour ends after breakfast in LIPARI on day 6. By boat you travel back to Milazzo, from where a frequent train and bus service or a taxi can bring you to the airport. Taxi transfers to other destinations are available on request. N.B. During the Summer season there are as well direct ferries from Naples to the Aeolian Islands. It is possible to include extra nights at the beginning or the end of the tour. The tour can easily be extended with a few days in Catania or any other of the main Sicilian towns (Syracuse, Taormina, Palermo) as well as several other destinations on the island. Several good accommodations are available, ranging from 2 to 5-star). Details and prices on request. 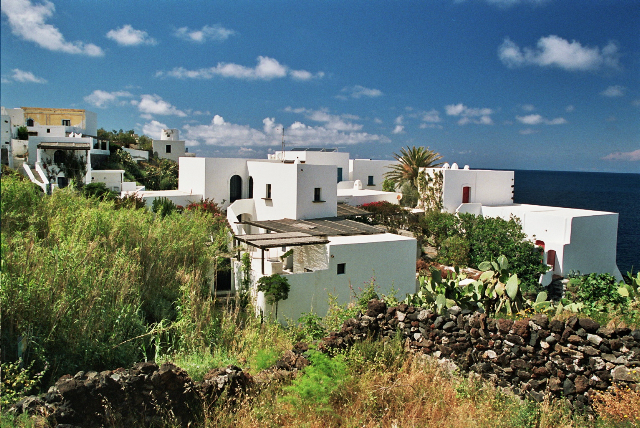 It is possible to spend two extra nights on Stromboli or Salina (eventually dropping one night on Lipari). 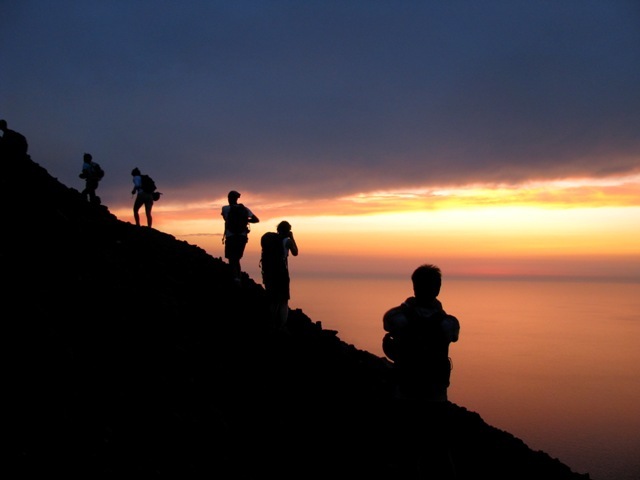 This enables you to do the walk to the top of the volcano at night – an unforgettable experience! 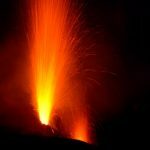 This tour can be extended with a few nights on Mount Etna, making you ‘volcano exploration’ complete. 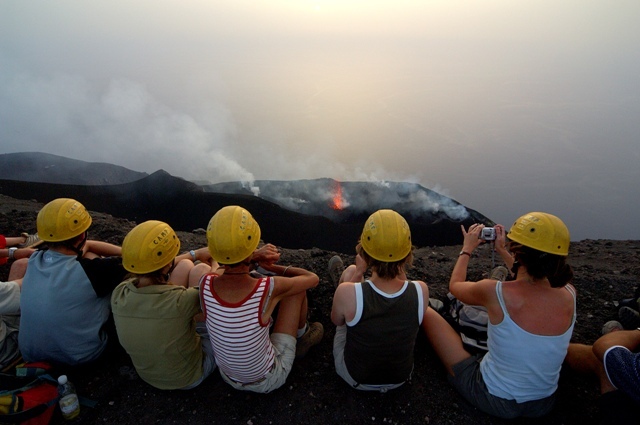 Have a look as well at our longer tour: ‘Volcanoes of Sicily – Etna & the Aeolian Islands’.